A computer science minor will be available to Ryerson students as of September 2018. The proposal to create the minor passed unanimously at a Senate meeting Nov. 7. The minor will be comprised of six courses in total: two mandatory courses and four electives, according to the Senate meeting agenda. Students can group their electives to create concentrated streams such as computer organization, robotics, data mining, artificial intelligence and cryptology. “I think the demand was there. A lot of students have been requesting a computer science minor,” said Razi Syed, an at-large student senator. “Computer science is a big field at the moment and it’s just getting bigger. It has basically infiltrated every aspect of our lives, and you have good graduate prospects with computer science. It’s a good field to be in at the moment,” Syed said. The minor will allow students to “gain some functional knowledge of software development.” It will also “create a body of non-computer scientists” who understand computer science and can then translate this into their own area of study, the agenda outlines. All of the courses included in the minor are already offered at Ryerson, meaning no new courses have been added. Students can start taking courses now to count towards the minor, according to Syed. 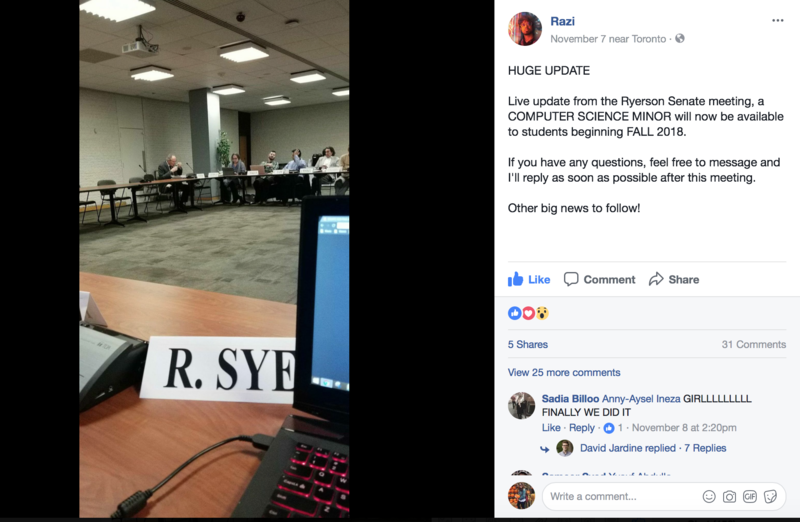 A screenshot of Razi Syed’s Facebook post from the Senate meeting announcing the computer science minor. The creation of a communication design minor and a master of health administration (community care) program were also approved at the Senate meeting. Syed noted that for a motion to be implemented in the fall, it needs to be approved at the Senate’s November meeting, which might explain the busier agenda. “The next couple of meetings will be a little quieter, I think, but still … this shows how innovative [Ryerson is] and how we’re moving forward right now,” Syed said.